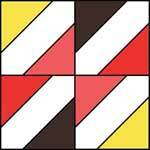 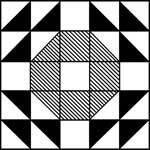 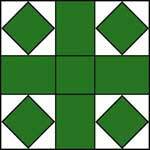 The Wind Blown Square is a sort of topsy-turvy quilt pattern originally pieced in white with light and dark prints. 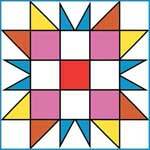 Of course analogous colors always make lovelier quilts as lavender and violet, buff and apricot, or pink and rose. 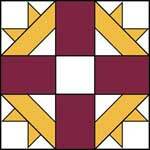 Contrasting colors may also be used, such as peach and jade green, or yellow with blue-purple. 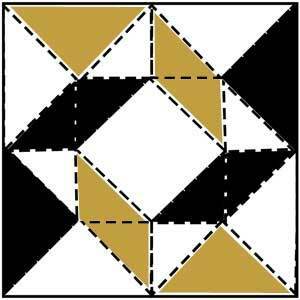 Fabric Estimate: In making this Wind Blown Square quilt, 36 pieced blocks are put together with 36 plain 9-inch blocks, 8 blocks wide by 9 blocks long. 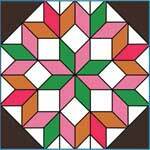 This quilt finishes at about 72 inches by 81 inches, and requires 1 yard of rose, 1 yard pink, and 5 1/2 yards of white fabric.Seams are not incorporated into the pattern so be sure to allow for seams. 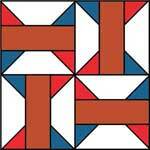 The Four Flowers design would quilt beautifully on the alternate plain blocks. 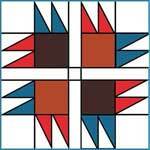 Click on image to print the 5" block of the Wind Blown Square Quilt Pattern.